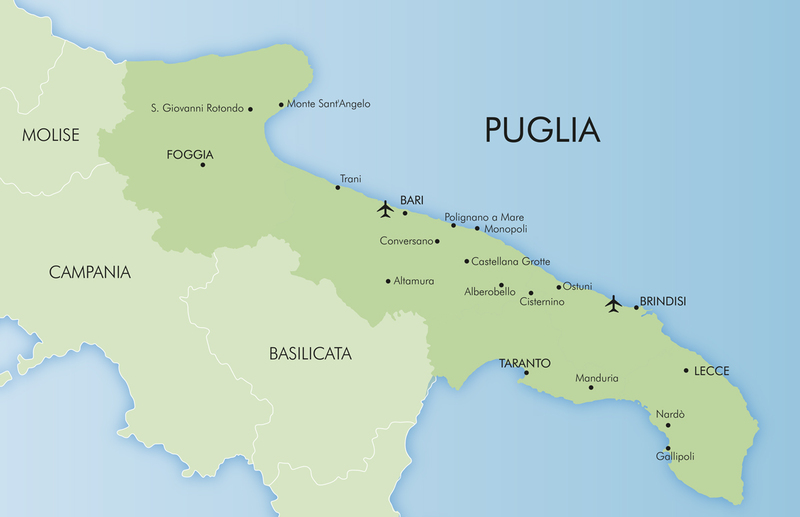 Indulge your passion with a Puglian Wandering Holiday. "We would use Simpson Travel again and again. Villa Favorita is amazing and the Simpson Travel representative, Francesco, was just wonderful. No negatives, just an exceptional service." "Thank you for our holiday in beautiful Villa Flavia. We enjoyed every minute. Puglia is a gorgeous region and this villa is in the perfect location to explore the nearby towns, villages and countryside." Puglia is the ‘heel’ of Italy, on one side caressed by the waves of the Ionian, on the other the Adriatic Sea. A long, slender peninsula, it’s drawn the attention of traders and invaders for centuries; the Greeks, Romans, Austrians, Spanish and French all claimed it as their own and then left their legacy of spectacular Byzantine, Romanesque, Gothic and Baroque architecture. But it’s not these impressive buildings, tucked away in the ancient hearts of villages and towns, that Puglia is most famous for. Instead it’s the indigenous fairy-tale trulli houses: a nod to the fact that what Puglia often does best is be itself. This is a landscape defined by its olive groves: countless rows of trees rising out of the fertile red soil, some thousands of years old. As they age, the gnarled trunks often split, turning one tree into two, which entwine like dancers, beautiful in their old age. Compared to the lush greens of Tuscany and Umbria, Puglia is more desert-like, less tamed, with woodland and vineyards, but also rocks and cactuses shouldering up to the dry-stone walls. One of the richest areas of flora and fauna is the Valle d’Itria, home to Alberobello, the UNESCO-listed trulli village, and towns, such as Ostuni and Locorotondo, carved out of the area’s pale stone and whitewashed to even greater brilliance. From the cragginess of wind-hewn rocks to the palest, softest sand, Puglia’s 900km coastline is spectacularly diverse and the choice can seem overwhelming. To get to know the spirit of the region a little better, town beaches, such as Poligano a Mare, are a fascinating place to start, with seafront promenades, boat trips and surrounding shorelines punctuated by pretty harbours, as well as the winding streets of Old Towns to explore for lunch. Alternatively, the nature reserve of Torre Guaceto offers a less bustling experience with lots of snorkelling potential. Beach clubs are plentiful too and, around Capitolo in particular, they’re also elegantly upmarket – or you can avoid the entry fee and choose a ‘free beach’. But don’t expect to have it all to yourself, particularly in high season. Food is Puglia’s great love – passion, hospitality and tradition combined – and lunchtimes are sacrosanct, which is why most shops are firmly shut from 1pm to 4pm as staff return home to eat with family. Recipes are simple and bursting with fresh, seasonal ingredients, the rich notes of local olive oil running through them. It makes farmers’ markets a place of weekly pilgrimage, particularly in rural areas where the preference is to put money back into the pockets of the locals. Unsurprisingly, seafood features prominently, recently scooped from the water, no cooking required – and what Puglia can’t do with dairy products isn’t worth considering. You’ll find Michelin-starred restaurants in Conversano, Monopoli and Alberobello, but the essence of Apulian cuisine is simplicity where natural flavours are brought to the fore. Fish and shellfish appear on every menu – and from clams, prawns and oysters to tuna and salmon, they’re often consumed raw and always with gusto. Meat is rarer, with lamb the favourite, but the beef bombette pugliesi, a classic Valle d’Itria dish, has many fans, particularly at festivals. This being Italy, there’s also a signature pasta dish too, orecchiette, shaped like tiny ears. As well as producing 40% of Italy’s olive oil, Puglia is home to the celebrated Altamura bread and some of the country’s finest mozzarella. If cheese appeals, the soft, round mozzarella burrata (like edible silk with added cream) is a must-try and occasional companion to the traditional focaccia pugliese: thick doughy bread with tomato, potato and oregano that makes the perfect sightseeing snack on the go. Puglia is Italy’s largest wine producing region and its famous Primitivo wines are everywhere, although Manduria (with its wine museum) is the epicentre. In Bari and around the east, Bombino grapes make an appearance in reds and rosés, whilst the north favours Negroamaro. For post-dinner tipples, limoncello is a popular choice, or a warming green walnut liqueur made with spices. You’re also likely to encounter amaro, an umbrella term for various types of traditional bitter-sweet liqueurs, such as the bright orange Aperol, which are served neat as digestifs or mixed in cocktails. The coastal path will lead you to numerous little bays for swimming, but Polignano’s small and pebbly main beach, below the clifftop Old Town, is particularly picturesque. The town is a 35-minute drive from Bari, along the coast road. The main beach gets very busy. For a slightly quieter spot, try Polignano’s Cala Paura, a small stony beach with clear blue water – or hire a boat and go exploring. This popular town beach resort sits around the point where the dramatic rocks of Puglia’s Adriatic coastline give way to soft sand, with plenty of beachfront restaurants, cafés and shops. Halfway between Bari and Brindisi, and part of Fasano, Torre Canne is a 30-minute drive down the coast from Polignano. The town is also known for its thermal springs, and you can soak in the waters, take a mud bath and enjoy massages at the well-equipped health spa there. Within a protected marine and nature reserve, this picturesque sandy beach has clean, clear waters, perfect for swimming, but it gets busy so aim to arrive before 10am. The beach is about half an hour down the coast from Torre Canne. The Torre Gauceto Visitor Centre (Centro Visite al Gawsit) has a museum, aquarium and botanical garden, as well as information about local activities, from walks and tours to workshops. A ruggedly beautiful pebble beach in a national park, with beautiful clear waters for swimming and various hiking and walking trails through the surrounding forest. There’s also a picnic area. A 20-minute drive from Nardò. Leave your car by the road and walk down through the trees, which takes another 20 minutes. The coastline is characterised by caves, some above the water, such as Grotta del Cavallo; others below, like Grotta delle Corvine, rich in marine life. Family-friendly, busy sandy beaches with clear seas line up one after another in this protected marine reserve, the Caribbean-style loveliness of Torre Lapillo being particularly noteworthy. Porto Cesareo 25-minute drive from Nardò. Many archaeological treasures have been found in the area, making the Museo di Storia Naturale Marina e della Pesca a fascinating stop-off for history buffs. From bars, restaurants to volleyball and live music, Puglia’s beach clubs offer all the essential facilities and more – and you’ll find many of the most elegantly upmarket near Capitolo. Every stretch of coastline boasts a beach club, so simply go exploring. Entry ranges from 10 to 40 euros per person, with parking on top. However, tucked between the clubs are free beaches sharing the same stretch of sand. As well as wandering the rows of charmingly quirky houses, join a tour of the two-story Trullo Sovrano, a recreation of 17th-century trulli living, or visit the quieter Aia Piccola district where many of the conical limestone dwellings are still called home today. Enjoy a half or full-day excursion from Monopoli to Polignano a Mare and you’ll glide gently past caves, coves, beaches and fortified towns, with swimming stops and pretty harbours along the way – with plenty of time for a few local delicacies en route. A gleaming white crown on a small Valle d’Itria hill, this is officially one of Italy’s most beautiful towns and offers an alternative to Puglia’s famous red wines in its locally produced bubbles. Dine out in the historic centre after taking in the views. Discover a spectacular subterranean landscape of stalactites, stalagmites, caves and canyons on the edge of the beautiful Valle d’Itria. The tour covers 3km of underground walkways. For full details, visit www.grottedicastellana.it/en/. The pretty town that has lived and breathed pottery since the Middle Ages is the place to buy the egg-shaped pumi di fiore that adorn houses across Puglia: a symbol of good luck. And don’t overlook the town’s other claim to fame: its wine. Get to the heart of Puglia’s passion for food with a morning at Dire Fare Gustare, voted one of the best cookery schools in the world by Vogue magazine. You’ll feel like one of the family particularly, with the long lunch that follows. Whilst it’s the 13th-century cathedral that literally takes centre stage, with a supporting cast of churches and an impressive archaeological museum, this town is famous for its eponymous loaf and no visit is complete without an official tasting. At Fasano’s Zoosafari, you’ll be surrounded by big cats, giraffes and elephants in the driving section and then you can stretch your legs and explore the rest of the wildlife experience on foot. There’s also a Sealion Aquarium and the Fasanolandia theme park. Talk to our local representative about a round at Fasano’s championship 18-hole golf course, one of Italy’s finest. The location, overlooking the sea and near the ancient Greek city of Egnazia, is truly spectacular – hole eight gives you a view of the necropolis. How are you? Come stai? How much is it? Quanto costa? The Federicus Medieval Festival in Altamura includes a theatrical costumed street parade with juggles, fire eaters and performers. The Festa di San Nicola commemorates the arrival of the saint’s relics into town in 1087 and on 7 there’s a costumed procession. Conversano’s Cherry Festival (Festa delle Ciliegie) is a gathering of local producers in a suitable celebratory atmosphere of music and craft markets. Bari’s Metropolitan Jazz brings together top international performers in a range of inspiring locations, from Alberobello to Polignano a Mare. The midsummer festival of San Giovanni in Ostuni includes a live parade, followed by fireworks and a late night live music event. The Locomotive Jazz Festival in and around Lecce is a ten-day event bringing together top musicians for a programme of contemporary, innovative performances. Sagra degli Altri Tempi (The Festival of Yesteryear) is hold in Ostuni’s Old Town: a celebration of traditional food and crafts. Sagra Pirotecnica della Valle d’Itria: a five-day firework spectacular in honour of Locorotondo’s patron saint, San Rocco. The show starts late and is worth staying up for. La Cavalcata di Sant'Oronzo is Ostuni’s celebration of their patron saint, during which his statue is paraded through the streets, accompanied by knights on horseback. The Festa te lu Mieru in Carpignano Salentino, Lecce, is a wine festival with plenty of food, music and traditional dancing. Founded by the Greeks, Monopoli has always been a thriving port town. Although 20th-century developers brought little to the party, cut through the 1950s buildings, and you’ll find the beating heart of antiquity in the palaces, churches, towering Baroque-Romanesque cathedral and lively squares of the Old Town. The imposing 16th-century castle now houses exhibitions and has lovely sea views, whilst in Porto Vecchio harbour, you can still see the fishermen’s traditional gozzo rowing boats, many of them painted a vivid sky blue. On the waterfront, there’s an exuberant statue of the singer Domenico Modugno who was born here: it sums up the vitality and creativity of this lovely town, where poetry is written on stone steps and wooden doors, summer festivals celebrate books and art, and ice-cream comes highly recommended! The most scenic spot is from the impressive arched stone bridge with views down to the beach and across to the dramatic clifftop Old Town, where the annual Red Bull Cliff Diving competition takes place. Straight out of a fairy tale, Puglia’s most popular tourist attraction is a must-visit for its charm and UNESCO-heritage status. Limestone trulli houses are unique to the region and Alberobello, in the unspoilt Valle d’Itria, has about 1,500, many painted with Christian and pagan symbols to protect them from evil. Away from the main trulli village, the Corso Vittorio Emanuele, which leads down from the impressive town church, is lined with a tempting collection of upmarket boutiques, bars and restaurants. Another gem of the Valle d’Itria with its share of whitewashed houses and grand churches, Cisternino marches on its stomach more than most. A member of Cittaslow, inspired by the Slow Food movement, it holds a number of food festivals in August and is famous for its bombetta pugliese, street food cooked and served by the town’s butchers. To blend in with the locals, follow their lead and take a sociable evening stroll or passeggiata, with an aperitif in the main square. Rising up on a hill above an otherwise flat landscape, with its gothic cathedral marking the summit, the whitewashed stone of ‘The White City’ sets it apart from the plain of olive trees below, beyond which is the Adriatic Sea and a number of exclusive resorts. Put your map away and explore the labyrinthine lanes of the Old Town, designed to perplex invaders, or follow the main street for boutiques and souvenirs. The Piazza Libertà is a great place to sit and watch the world go by. The outskirts are far from glamorous, but cosmopolitan Bari, home to Italy’s fourth largest opera house, captivates with its ‘big city’ energy, and the picturesque Old Town or Bari Vecchia offers history on a grand scale. There, an impressive Romanesque cathedral and basilica vie for attention, near a formidable medieval castle, and, when you need a break from strolling and sightseeing, good food is readily available, from on-the-go snacks to fine dining. There’s also a seafront promenade which leads to the modern shopping district. There’s no need to be adventurous in your exploration of Conversano. The main attractions are neatly gathered around the Piazza Castello, alongside a choice of bars and restaurants, including Michelin-starred Pashà. The castle, a jigsaw of architectural styles with a museum inside, is likely to be your first port of call and, illuminated at night, it makes a spectacular backdrop for dinner. In the heat of the day, slip inside the peaceful Romanesque cathedral or walk the impressive cloisters of the San Benedetto monastery. An impressive Roman amphitheatre would usually be spectacle enough, but in the 17th century, architects brought Baroque to Lecce; the resulting churches, palaces and heavenly host of decorative cherubs offering an alternative view of history, including the fantastical Basilica di Santa Croce and the pale splendour of the Piazza del Duomo. Along with archaeological museums and a Norman castle, there’s a full day of exploring ahead of you, so sustain yourself with a morning coffee and a cream-filled pasticciotti pastry, another Lecce speciality. Like a smaller version of Lecce, Nardò is a shining example of ornate Baroque architecture and also just 20 minutes from the charming port of Gallipoli and the Porto Selvaggio National Park. The beautifully elegant Piazza Salandra, the main square at the heart of the Old Town, comes alive at night, and after an early evening spent exploring winding streets and ancient churches or the frescoes in the cathedral around the corner, it’s an excellent spot to sample a glass of the local wine.